A few years ago, I came across a dissertation paper that was studying officers’ spouses. The study found that as the service member was promoted in rank (and the spouse became a more senior spouse), there was an increase in isolation which led to increased depression and anxiety. That part may not surprise you. But then I came across one sentence that said that the increased isolation these spouses experienced was very similar to what was commonly seen in a pastor’s wife. 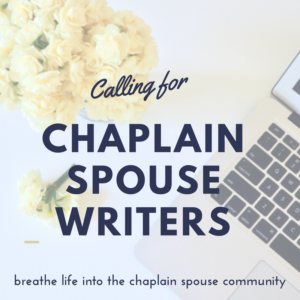 The Chaplain Spouse Blog is an authentic and safe blog . 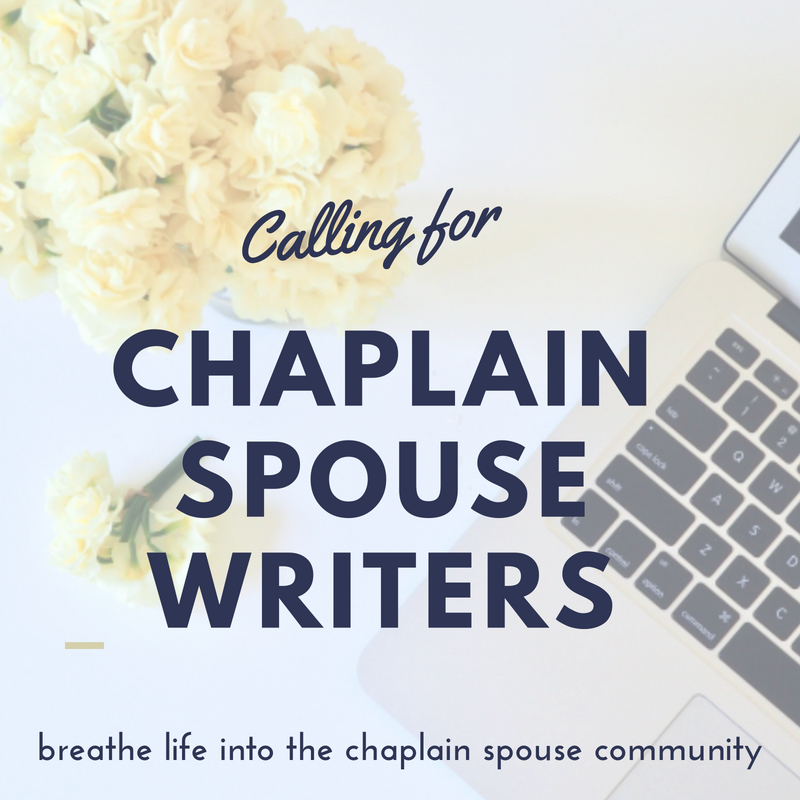 I am inviting chaplain spouses who are interested in writing to join me in creating authentic meaningful content for our community. If you are interested, here is what you can expect. The Lifegiver mission statement is purely to “provide a place for honest conversation and breathe life into our community.” Although that sounds pretty vague, it hopefully sets the tone for positive content while remaining authentic. 1. Is there a commitment? Not at all. For those who wish to write regularly, I will definitely consider it and welcome having new and fresh content. I personally work better when I have deadlines each month, but you may be in a place where you want to write as you feel prompted by a topic. If you are working on a piece, I wouldn’t mind getting a heads up though! 2. Is there any payment involved? At this time, no. In order to keep Lifegiver a free resource, as well as a nice platform where people want to come, I do not take sponsorships and therefore do not have incoming funds to pay out. I have hesitated reaching out for contributors or team work for a long time because I have not wanted to “ask” for more than what I know you already give to the community- especially as a volunteer. However, I also want to be obedient to the prompting I feel to give you a place to both give and receive positive, encouraging content. 3. How will you decide who will be a contributor? I am not currently turning people away from this opportunity as of yet. I would definitely encourage you to turn in any brief writing samples you may have. If you are just beginning, that is ok, too! We all have to start somewhere. Just like a family, I expect to have various writing styles and experience. The great thing about a blog like this is that I can create categories like devotionals, educational, PTSD, support, etc. However… Any articles, or behavior, that is divisive, destructive, or does not have healthy movement forward will not be included as it does not align with the mission statement. 4. Will you be including faiths other than Christian? As of right now, yes but with some limits. This may change, but it would not be helpful to our community and in line with the calling of a chaplain family to not be inclusive. There will be limits to faiths that are attempting to proselytize through the blog. This is a place of support. I will also have the ability to create categories on this if necessary. Limits on this also go back to being filtered through the mission statement. 5. What topics can I write on? What is most important to me (and I believe to the community), is that it is authentic, relatable, and has movement forward. In other words, I would love for content to deal with tough topics that are rarely talked about openly, even if they feel negative. I only ask that the article ends in encouragement and movement forward. 6. What is the process of being accepted and submitting an article? After you receive an email acceptance from me, consider asking for feedback from me or other chaplain spouses on your topic. Send me an email on a topic you would like to write on and start writing! Aim for 800-1000 words. Send in your article and wait for editing. Receive your article with edits; approve or appeal any changes until an agreement is made. 7. Do I have to make images for my article? If you are interested in this exciting opportunity to serve, fill out the form below!